Update 2018-05-14: SketchOSM is now available at the SketchUp Extension Warehouse! My name is Dale and our team developed PlaceMaker, a popular commercial SketchUp plugin that imports 3D geospatial information (including OSM data) and optimizes it for SketchUp users. I want to introduce a new OSM editor that we have developed for the main purpose of making it easy to add more 3D Buildings to OSM. The editor is a plugin for SketchUp so you need to have SketchUp Make (free) or Pro (2017 or newer) installed in order to use it. Download SketchUp 2017 Make for free. SketchUp Pro 2017 or newer can also be used. Install SketchUp by double-clicking the downloaded installer file. 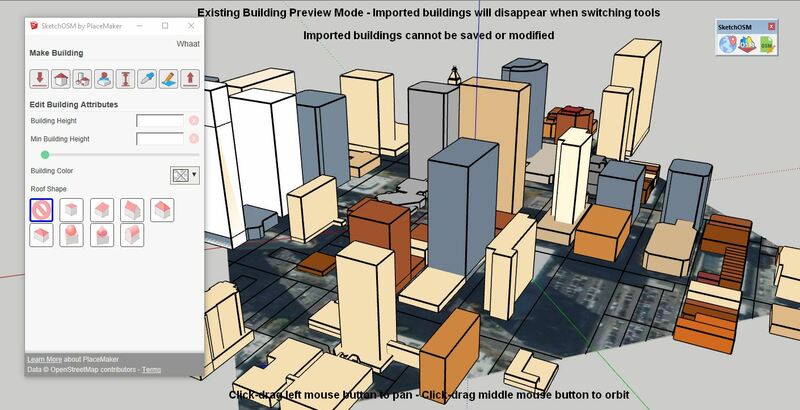 Geo-locate your model to select the location you want to create buildings. For best imagery resolution, zoom in to the max level before importing. Upload buildings to OSM if desired using the upload button in the dialog. Could you add the number of levels to the attributes set? You can add a height attribute to a building with SketchOSM, but not number of levels. That was a feature request, not a question. Also the tags addr:housenumber and addr:street are important for all map applications. Could you add those attributes as well? We will likely add number of levels, and address tags in the future. Thank you for the feedback! Please don't provide your users access to sources that we are not allowed to / can't use. Thank you for the message. The Google Streetview feature shown in the video is actually not part of SketchOSM. I realize this is confusing so we will take down our video and upload a new one that does now show any references to Google Streetview. We will not encourage our users to use Google Streetview as a reference. Our desire is that SketchOSM have full support of the OSM community. SketchOSM has now been officially released on the SketchUp Extension Warehouse! See first post for updated installation instructions. We just released an update which fixes issues where the plugin did not work if a user had their decimal separator set to a comma instead of a period. Please give it a try and let us know what you think. Is this a useful tool to anyone? When I try to login to OpenStreetMap. A message box shows "Sorry! SketchOSM requires you to have Internet Explorer 9.0 or greater installed. You currently have version 7" But, my OS is Windows10. How to solve this problem? Thank you very much! Even though you have Windows 10, it might be possible that your IE version is old. I think Windows 10 uses Edge as the pre-installed browser now. SketchOSM (and all SketchUp plugins) display UI dialogs using the current IE version that you have installed. Unfortunately, we as the developer have no control over this (we can't choose to use Chrome or Edge for example). Installing IE 11 should fix your problem. It would be great if you can also change existing objects after reading, this unfortunately does not work.